My brain is on overload right now. Rugrats is a show that I know too much about. Sadly, every person my age has the same plethora of knowledge about the subject. Apparently Rugrats was the longest running Nicktoon with 172 episodes only to be beaten by Spongebob Squarepants this year. The best way to delve into the show is to do a character study because there are more characters in this show than friends that I have on facebook. 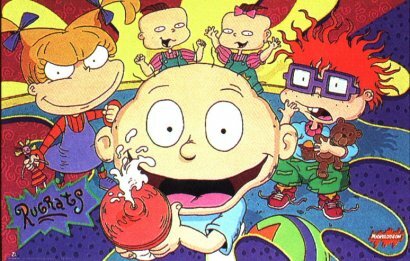 The Gang: Rugrats was a show about just that: toddlers. They got into lots of trouble and 172 more adventures than the average toddler. The main character was Tommy Pickles who seemed like the youngest because he was bald, yet he was the leader of the pack. He was the brave one, the nice one, and the smart one. Pretty boring. Chuckie Finster was Tommy’s best friend. He seemed older because he had a full head of crazy red hair, clothes, and glasses. It freaks me out when toddlers have glasses. Do the optometrists just guess what their prescription is? Like, how do they tell you which slide is clearer? Regardless, Chuckie was always shy, nervous, and absolutely loveable. Phil and Lil Deville were part of the gang as well. Being twins, they always finished each other’s sentences and were perfect partners in crime. They were the grossest of the crew—eating bugs, playing in the mud, and picking their noses. Their mom, Betty was most def a lesbian. She wore the female symbol on her purple sweatshirt. Need I say more? Her husband Howard was pretty wimpy and looked like a clown. Let’s just say that the twins did not have good genes. Angelica Pickles is Tommy’s cousin on his father’s side. Angelica is one of the best antagonists ever in any show. She is spoiled, mean, jealous, loud, ruthless, dramatic–everything unattractive about little kids all thrown into one perfect character. Angelica’s doll Cynthia was her only true friend. Because she was dragged everywhere, Cynthia was pretty gnarly looking, with a face you couldn’t ever forget. You’d think with all their money, Angelica’s parents could afford to buy her more than one doll. 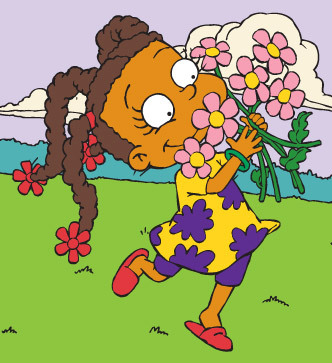 Susie Carmichael was a character that appeared on the show every so often. She moved next door to The Pickles. Tommy’s mom Didi brought them some yellow Jello as a welcome-to-the-neighborhood gift. I literally remember every single moment of this show. It’s so gross. I think they added Susie’s character because they needed more diversity. Susie was Angelica’s age and she was black so she kind of fit the bill. She was super nice and everyone loved her except Angelica. One of the best episodes was when Susie’s older sister and brothers babysat for the gang. It was such a good episode and it made me sad that Susie’s siblings didn’t make more of an appearance. Later, the show upped their cultural diverse level when Chuckie’s dad, Chaz, married a Japanese woman Kira who had a daughter, Kimi. This show left nothing up to the imagination. The audience was always aware of every background story. There were never any “How do you explain this?” or “Where did that person come from?” Everything was explained. Stay tuned for part 2: The Parents. This entry was posted in Nickelodeon Animated Shows and tagged angelica pickles, chaz finster, chuckie finster, cynthia, didi and stu, dill pickles, kimi, kira, nicktoons, phil and lil deville, rugrats, spongebob squarepants, susi carmichael, tommy pickles. Bookmark the permalink. I’ve never seen this show either, but I did glimpse it in passing…I muttered something about “ankle-biters” and let it go. It sounds better than I thought it would. Thank you!!!!! I still ended up having nightmares but maybe that’s because my parents let me watch The Omen when I was 8. But I know what you mean. Rugrats was definitely a “kids show” but I can still appreciate a lot of it as an adult now. I think we liked Chuckie more than Tommy because we could relate. Tommy always seemed spoiled to me. Chuckie was growing up without a mother while Tommy had everything handed to him. Umm I don’t remember that episode. Maybe you’re confusing it with Alice in Wonderland? No but seriously it kind of rings a bell so please go into more detail. Yeah Tommy was so fearless for a one year old. That’s not relateable. Chuckie was more realistic for sure. What I’m trying to say is, yes I agree with everything you say. I had something big I typed as a response but it got erased so all I will say is my least favorite episode was the one where Angelica threw up which probably does not narrow it down because there was a lot of pooping and throwing up on that show. Throwing up from eating all the cookies? I feel like you have skewed Rugrats memories. Whaaaat I never knew Chaz got married, maybe I missed the later episodes, I did love Rugrats though, I remember going to see the first movie at the cinema. They’d never show that stuff nowadays! They went to Paris I think. I’m not sure I was a fan of the sequel series that came out after Rugrats, All Grown Up with Tommy’s stupid purple hair. Just milking a fanbase there. Phil and Lil were my faves, likely because they weren’t in every episode so when Nick Toons trotted them out, it was kind of a big deal. Mark Mothersbaugh from Devo wrote the theme music to Rugrats. When I first learned that, my head almost exploded. Coolness runs in circles. Yes! I remember that as well. He wrote a lot of good theme music apparently. I think Nickelodeon used him quite a bit. Did you know that Klasky Csupo, while animating Rugrats were also animating The Simpsons at the same time? Weird….but yes. Coolness runs in circles.